One of the many things I love about Twitter is the competitions. I’ve won a few things on there now including a year’s supply of Mission Deli wraps, various cake decorating bits and pieces, and books. I was hugely excited recently to be told I had won tickets for the BBC Good Food Show in Birmingham. (What a brilliant day that was)!!! Even more exciting was a message accompanying the news that I had won. 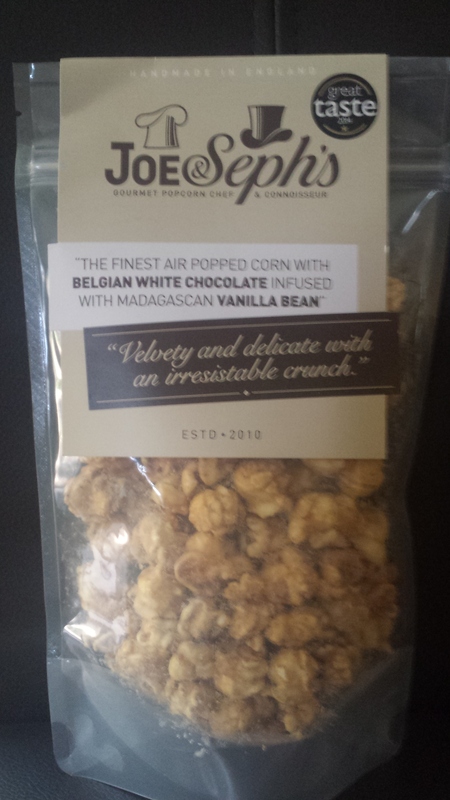 The prize was given to me by the lovely people at Joe & Seph’s Gourmet Popcorn and they noticed I had a blog. They asked me if I would be interested in coming up with a recipe using their popcorn. They told me to look on their website at all the delicious flavours of popcorn they make, and to see which one I wanted to use in a recipe. If you know me, you’ll know I am useless at making decisions, so this was a problem! With flavours such as strawberry cheesecake, peanut butter, maple syrup and pecan, Belgian chocolate… this was going to take a while! I finally settled on Belgian White Chocolate with Madagascan Vanilla Bean. I was then sent some packets to use in my recipe. As soon as I saw the packets I could tell this was going to be amazing! Each piece of popcorn was covered in a scrumptious looking coating and not one unpopped kernel in sight! I thought I had better try a piece so I could tailor my recipe to the flavour better. In the words of Julia Roberts in Pretty Woman… “Big mistake! Huge!” The first thing that hit me as I opened the packet was the gorgeous smell. Then I ate a piece. Oh dear lord, it was heaven! I love popcorn but I hate those tough layer bits that stick in your teeth. Luckily there is none of that with this brand. And they taste divine!!! Light as air yet crunchy, and such a beautiful taste. So why was it a mistake to try a piece before I put it into a recipe? Well I’m ashamed to say I couldn’t stop at one piece. Or two. Or even three. My partner and son wanted to know what was so special about it so tried some too. Before I knew it we had…erm… well, we’d eaten the whole pack. I then had to confess to Joe and Seph’s that I had turned into a pig, but it was their fault for sending me something so yummy! Luckily they were at the Good Food Show so I could buy plenty more to replace what I had eaten. And here is my star tip if you decide to make the recipe I came up with…. buy more popcorn than you need, as trust me, you WILL struggle to not eat it all beforehand. 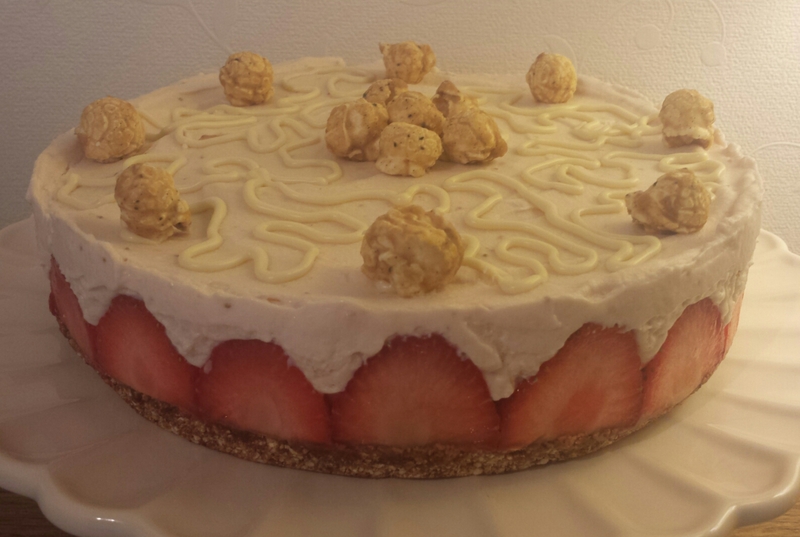 I decided to make a light Summery dessert and thought the white chocolate would go beautifully with strawberries. 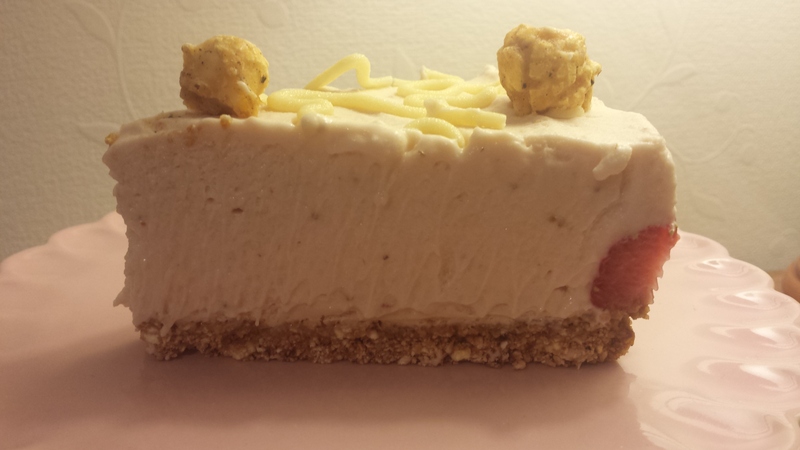 So here is my white chocolate and strawberry mousse with popcorn crust recipe. Preheat your oven to 180C. Line an 8 inch springform or loose bottomed tin with foil. Make sure the sides and bottom are completely covered. Place a handful of popcorn to one side to use later as decoration. Use either a food processor or a hand blender to crush up the remaining popcorn. You want to make sure its not too fine like powder, but rather tiny chunks. Mix the melted butter with the crushed popcorn. It will still feel a bit dry, but thats ok. When it bakes, the white chocolate and caramel from the popcorn will help it stick together perfectly. Press the mixture into the bottom of the tin. Press hard with the back of a spoon until the base is even and tightly packed. Bake in the middle of the oven for 10 minutes until golden. When you remove the tin from the oven, the popcorn base will have bubbled up in parts. Just press it back down with the spoon. It will feel very soft but don’t worry… it will firm up as it cools. Leave to cool completely, then place in the fridge for half an hour. Cut the stalk off a large strawberry. Cut straight across the top so it has a flat surface. Then slice the strawberry into 3 vertically. Arrange these upside down around the edge of the tin, Continue cutting large strawberries until the edge is completely filled. Place the gelatin leaves in a small bowl with enough cold water to cover them. Leave to soak for 5 minutes. Meanwhile, remove the stalks from the rest of the strawberries and in a blender or food processor, blitz them until they are liquid. Place the strawberry juice into a small pan and heat gently over a low heat. Gently remove the gelatin from the water, squeeze out the excess water from them and place them into the strawberry juice. Stir gently until the gelatin has melted, then remove from the heat. Leave to cool for a couple of minutes. In a large bowl, whisk together the double cream and condensed milk until it forms soft peaks. 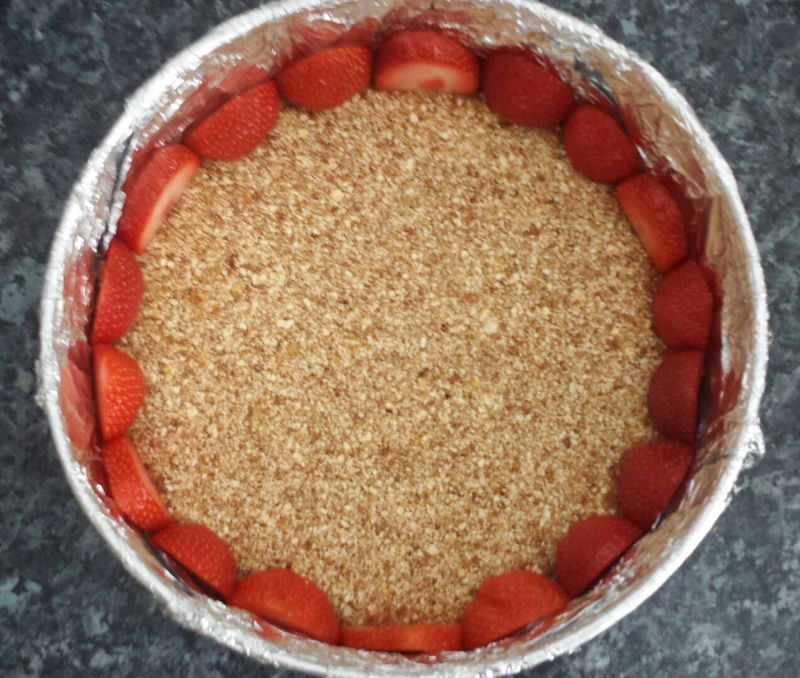 Very gradually, add the strawberry mixture, whisking constantly. If you add too much at a time, the mixture will split, so really take your time at this point. When all the strawberry juice is incorporated, pour the mousse mixture into the middle of the tin and gently spread it out to the edges, making sure the strawberry slices stay pressed against the side of the tin. Use a spatula to make the top even, then place into the fridge for at least 2 hours to set. Place the white chocolate in a bowl placed over a pan of barely simmering water, making sure the bowl doesn’t touch the water. When it has melted, stir and then pour into a disposable piping bag. Snip a tiny bit of the end off the bag, and then drizzle the chocolate all over the top of the set mousse. Use the reserved popcorn to decorate. Very carefully ease the mousse out of the tin and gently remove the foil. Enjoy! This popcorn base would also be perfect for cheesecakes. It is gluten-free, so would be perfect for coeliac disease sufferers for whom a usual biscuit base would be out of the question. It would also be delicious with the other flavours that Joe & Seph’s make. I have now tried quite a few of the flavours and they are all gorgeous. They also make savoury popcorn, and I shall be using some of that in another recipe very soon. DISCLAIMER While Joe & Seph’s did send me some popcorn at no cost to use, they didn’t ask me to write a review of their products, just to come up with some recipes for them. However, when I come across something special I like to tell everyone about it, and this brand certainly fits the bill. My views are honestly how I feel.